The Invisalign system is the virtually invisible way to straighten your teeth and achieve the smile you've always wanted. InLine Orthodontics uses digital imaging to depict your complete treatment plan, from the initial position of your teeth to the final desired position. 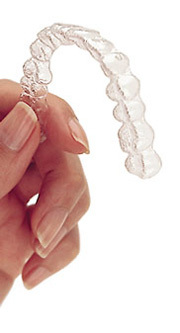 Then, a series of clear aligners are custom-made for your teeth — and your teeth only — to move them little by little. Each aligner is worn between 7-14 days before being replaced by the next in the series. You'll visit us about once every eight to ten weeks to ensure that your treatment is progressing as planned. Total treatment time and the average number of aligners worn during treatment will vary from case to case. Not only are the aligners virtually invisible, they are removable, so you can eat and drink what you want while in treatment. Plus, brushing and flossing are no problem. Invisalign treatment also allows you to view your own virtual treatment plan when you start so you can see how your straight teeth will look when your treatment is complete. For more information on Invisalign, you can visit the Invisalign website. or call us today to set up a consultation.